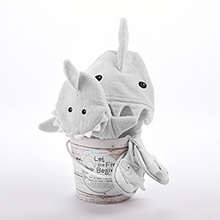 Bath time just got an upgrade with Baby Aspen's "Let The Fin Begin" bath set. This shark set was made for cuddles! 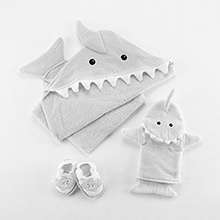 The gender neutral Gray color is the perfect baby gift for parents that are having a little surprise. Not only can you use this for bath time, but it's also great for days at the beach or pool. 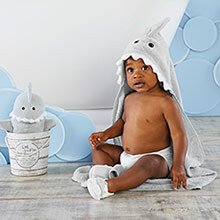 You'll have the cutest shark around!